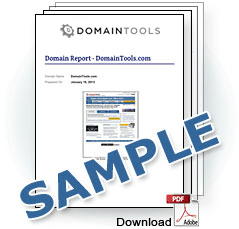 Enter a domain name for a FREE preview of all the data you'll get in your report. If you decide to buy a report, our system will gather the data into a single PDF document that you can download within minutes of your purchase. Log In to view your reports. Learn how DomainTools takes indicators from your network, including domains and IPs, and connects them with nearly every active domain on the internet. These connections help security professionals profile attackers, guide online fraud investigations, and map cyber activity to attacker infrastructure.